Any parent of a teenager knows just how moody they can be. The mix of hormones, social stress, and physical change all contribute to sometimes unpredictable mood swings and adolescent drama. But what parents–and teenagers–too often overlook is the affect too little or too much sleep can have on a teenager’s mood. As Meenakshi Prabhune reports in Science News for Students, a new study out of UCLA outlines just how much sleep teenagers must get to preserve good moods and productivity during their developing years. As K-12 school leaders and medical professionals across the country consider whether shifting school start times can help boost student performance, studies like these help shed light on what is—and isn’t—a healthy sleeping pattern for teenagers. The new study, led by Andrew Fuligni, an adolescent mental health expert at UCLA, surveyed students ranging from 13 to 19 years of age and asked them to record their sleeping habits, and their subsequent moods over two weeks. The study found that teenagers need between eight and 10 hours of sleep each night to maintain good moods the following day. While we all know that too little sleep can affect anyone’s mood, this research also found that too much sleep—more than 10 hours—can also be harmful to a teenager’s mental health. The study went on to find that older teenagers—say, 17- and 18-year-olds—need less sleep than 13- or 14-year olds. The study also confirmed the findings of previous research about when teenagers need to sleep. According to the study, teenagers’ biological clocks tend to shift to a later sleeping pattern, causing them to want to go to bed later at night and wake up later in the morning. According to Fuligni, the discrepancy between when teenagers naturally want to sleep and when they must get up to go to school may be harmful to some students. “We have setup a system that’s very difficult for many teenagers and some kids who might be at risk of mental and behavioral health problems,” Fuligni tells Science News for Students. Despite this latest study and other similar research, a study released this summer from the University of Michigan found that only half of parents support later school start times, according to Science Daily. Shifts in school schedules mean big changes for parents’ morning and evening routines. So, the skepticism we see in the Michigan study isn’t surprising. Want more on school start times? Sign up for the TrustED newsletter. But the study also found that parents’ opinions on school start times are often fueled by a misunderstanding about how a lack of sleep can affect their children. 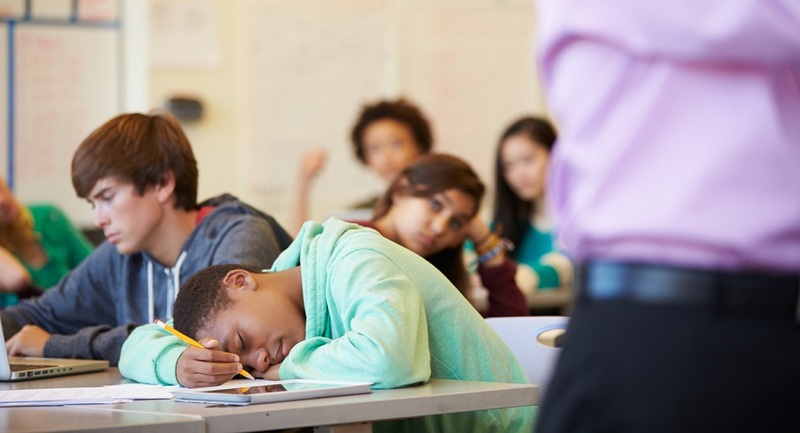 As school districts consider shifting school start times, school leaders need to ensure that school leaders, faculty, parents, and students are all informed on the latest research when it comes to student health and just how important regular sleep is to teenage development. Are you considering a shift in school start times? How does your school or district engage your community around student sleep health? Tell us in the comments. Be the first to comment on "Study: School start times could be harmful to teenagers"